The first time I heard "Long Black Train" on the radio, I was sure that it was Randy Travis; after all, Travis recently released a powerful gospel album and this song certainly fits that genre. 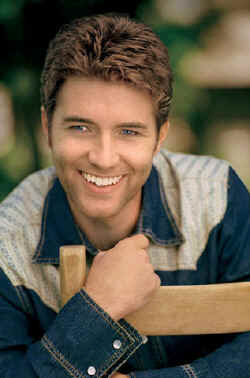 I didn't find out until I saw the video that the singer was Josh Turner. I was impressed. And when I saw the video, I was even more impressed because it is as dynamic as the song. However, the rest of the album proved to be somewhat disappointing. The label was smart to release this song first; it is definitely the best song on the album and it is also the most powerfully sung song. Unfortunately, the deep baritone that you hear on "Long Black Train" is seldom heard on the rest of the album. However, there are several songs on this album that I liked. "I Had One, One Time" is a really sweet and touching song. "Unburn All Our Bridges" and "She'll Go On You" are also lyrically beautiful. The problem wasn't the songs; it was the singer. For me, the rest of the album never quite got to the same quality voice level as the title cut. That deep, resonating baritone that you hear on "Long Black Train" just isn't there. The only other song on the album that even came close was "The Difference Between A Woman And A Man" but even on this song you end up wondering why all the background singers are singing so loud and why the vocal harmony? Do they really think Turner's voice isn't powerful enough to carry a song? Well, after listening to the entire album through several times. I'm wondering that same thing myself. I realize that my opinion differs from the majority of critics but I don't think Turner needs to worry. Despite what I think of this album, I really so love his voice on the title cut and he has all the right ingredients for success ... he is incredibly handsome, extremely charming, personable and genuinely humble. I think "Long Black Train" will be enough to keep him on track (pun intended) and on the charts.